Select the storage location where the export file should be saved here. The file can be created in the following formats: CSV, XLS or XML. 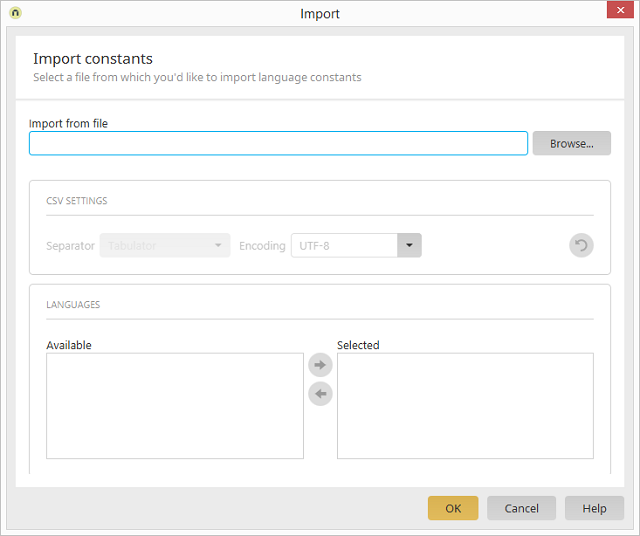 The ntrexx standard constants will be included in the export. If texts are missing, e.g. a missing title in French, an empty string is written. This has the effect that the language attribute "French" is created for this title upon import, provided it is not already available for the title in the target. If the setting is not activated, the attribute will not be created in the XML. Line breaks in texts are coded with <IXLB> in the CSV format. Select the type of seperator to be used for the CSV format. Select the type of coding to be used for the CSV format. This option will only display the languages that are used as Portal languages in the "Available" list. Move the languages that should be handled in the translation to the "Selected" list by using the arrow button. The order can be adjusted using the vertical arrow buttons; this affects the order of the columns in the export file. 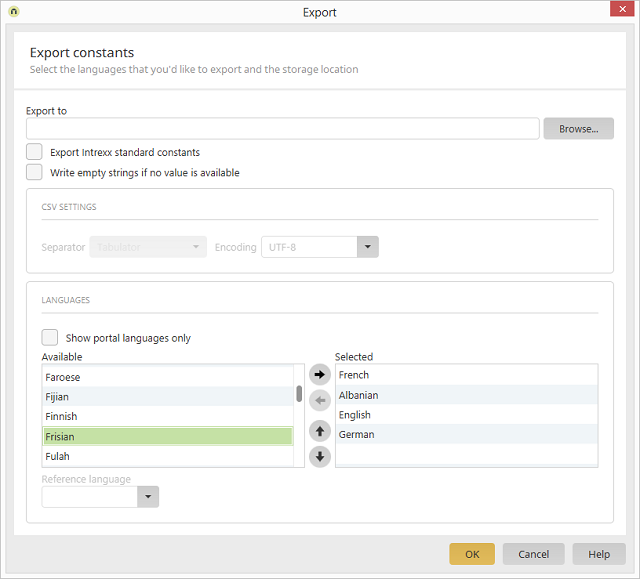 If you're exporting to an XML or Excel file, a language can be selected here that will function as the basis for translation. This will be made obvious in the exported file. Select the import file. The following formats are permitted for the import file: CSV, XLS, XLSX and XML. The remaining settings in this dialog correspond to the settings that were made when the export file was made.